Covers for Cover and Pearl, two new Jinxworld comics being written by Bendis and published by DC Comics. Brian Michael Bendis started his writing career doing independent creator-owned comics and, no matter how big he got in the world of large-scale superheroics, he always kept a hand in that realm. That tradition will continue at DC Comics, his new publishing home, which will be releasing his all-new ongoing series Cover and Pearl. Created under Bendis’ creator-owned Jinxworld imprint, the two books announced at The Hollywood Reporter will reunite Bendis with some of his frequent collaborators. 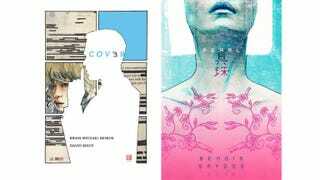 Cover is a spy-fiction series centered on a popular comics artist who gets recruited to be an intelligence operative, drawn by David Mack, who worked with Bendis on Daredevil. Michael Gaydos—who co-created Jessica Jones with Bendis—will be handling the visuals for Pearl, which is focused on a Yakuza tattoo artist who falls in love with her counterpart from a rival crime family. We have a tattoo artist with a very special skin condition that will make the tattoos on her body very unique — and you’ll see in the very first issue what’s unique about her and the way she makes her tattoos and what her tattoos on her look and feel like. But it also tells the story of two people who are born in this situation that have grown up and find out they may be very different than the situation they were born in. I see this going on a lot lately, more than ever before, where people grow up and go “OK, I was born into this situation, but I really feel I might be a different kind of person,” and find a way. Or they build their own family or they make their own happiness, and that’s the story we are going to tell. Head over to The Hollywood Reporter to read the whole interview and get more details about these new Jinxworld titles.